You exit the water and are ready to head to transition, but first your wetsuit. Getting out of your wetsuit can be tricky, especially if you panic and don’t focus on the task at hand. This will slow you down and lead to an extended stay in transition. Use the tips and steps below to ensure a smooth wetsuit removal. 1. Begin by releasing the Velcro closure on your collar. Take your opposite hand and slowly use the ripcord to pull down on the wetsuit. Imagine that you are unzipping your wetsuit in slow motion. Fast, uncontrolled jerks will add time to this process and only slow your transition. 2. Start to turn the wetsuit inside out. This entire process can be completed while you are exiting the water and finding your bike in transition. Your wetsuit should be rolled down and hanging off your waist by the time you reach your bike rack. 3. When taking off the bottom portion of the wetsuit, remember to use your arms. Do not use opposite legs when getting out of your wetsuit. Standing on the wetsuit could cause pavement, sand, or any other surface to puncture the wetsuit. Learn more about taking care of your wetsuit, including how to properly put it on in our blog post entitled Getting into Your Wetsuit. We are excited to reveal this year’s finisher medal! Along with is awesome bling, participants who register before September 1st will receive a personalized bib and their guaranteed shirt size! Watch the full video to see this year’s super soft tri-blend t-shirt and athletic trucker hat. 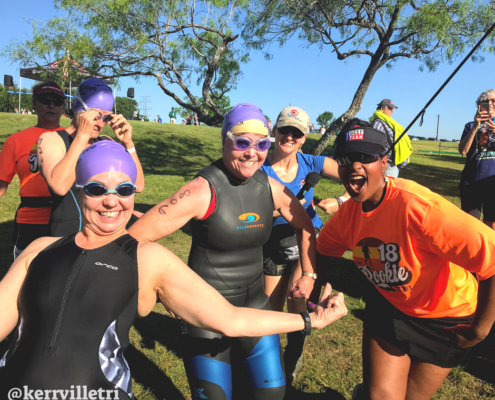 Camille Baptiste (far right) pumping up triathletes at 2018 Rookie Tri! For about five years now, Camille Baptiste has volunteered at many of the High Five Events. According to Baptiste, The Rookie Tri holds a special place in her heart. Swim in/out is her favorite volunteer position because she gets to see and encourage everyone before the race. Camille Baptiste loves to “be loud,” pass out high fives to everyone, and give back to the Austin athletic community. You’ll always see her with a smile on her face. She enjoys helping athletes having the best race experience they possibly can! The next available volunteer opportunities are at Jack’s Generic Tri (8/26) and Kerrville Triathlon Festival (9/28-9/30). Many people don’t realize that a few millimeter adjustments can make a huge difference on how they feel on their bike. If you have the feeling like you are not making gains or if you have pains after riding, you may want to try adjusting your saddle height. The saddle height is the distance between the heart of the pedal axle and the top of the saddle. Saddle height is set by adjusting the seat post to an ideal height that balances comfort and power on the bike. Saddle height is arguably the single most important adjustment on your bicycle. Incorrect saddle height can contribute to saddle discomfort, anterior and posterior knee pain, poor leverage, and ultimately limiting power production. When you are doing your best to fuel your body, you may be losing power other ways like incorrect saddle height. There are many methods and formulas to derive at “proper” saddle height. One of the best approaches is to establish it based on the rider’s individual ride characteristics and flexibility. If you are looking for recommendations, you can visit with Josh at Jack & Adam’s Fredericksburg or with the crew over at Mellow Johnny’s. 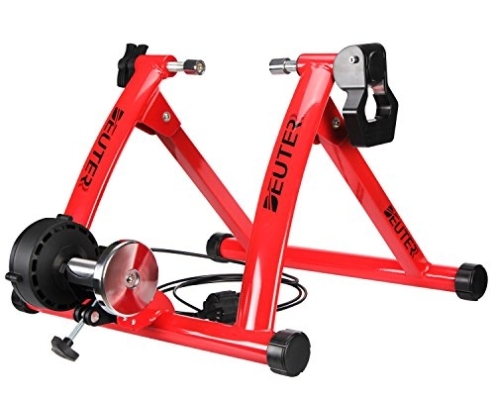 A bike fit specialist can detail in what way your individual characteristics and equipment may be contributing to any performance or biomechanical limitations. If you can’t make it to a bike fit there is still a solution. Before your next ride if you want to experiment at home you can follow the “heel to pedal method”. This will get you in the ballpark range before you can see a professional. First, mark the current height. Then, put your bike on the trainer. Pedal around to make sure you are in the position you normally ride in. Place your heel on the pedal and pedal backward to reach the six o’clock position. Your knee should be completely straight. If you are having trouble making contact with your pedal with your heel – the seat is too high. If your knee is bent – it is too low. Make very small adjustments, in millimeters until your leg is straight with the heel on the pedal. Once a proper height is found, wrap a strip of electrical tape around the base of the post where it meets the seat clamp. Take measurements and record in a safe location for future reference. Make the first few rides out on your new saddle height short and sweet. It can take a few rides before your body is adapted. It is good to get your bike fit looked at at least every few years or if you get new equipment such as new shoes or pedals. Check here to see how often you should replace some of your gear. 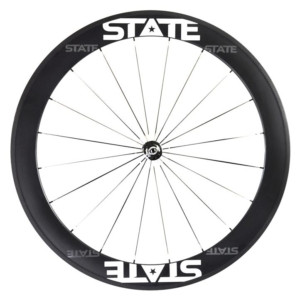 If you’re relatively new to triathlon then you’ve probably noticed many new terms, like tubulars and clinchers. 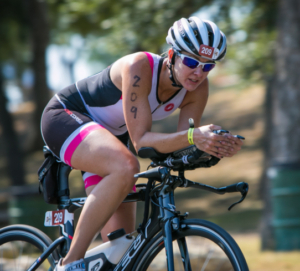 Even veteran triathletes are learning new terminology about the sport. Whether you’re new to triathlon or you’ve been racing for years, we break down the difference between tubulars and clinchers. Tubular tires, also known as “sew-ups” or “sprints” differ from clinchers in that they don’t have beads. Instead, the two edges of the tire are sewn together around the inner tube. Tubulars are used on special rims and are held on to the rims by glue. – you could get tire/rim separation, especially when rims are hot from braking and end up like Joseba Beloki in the 2003 Tour de France. separate inner tube. The edges of the tire hook over the edges of the rim and air pressure holds everything in place. 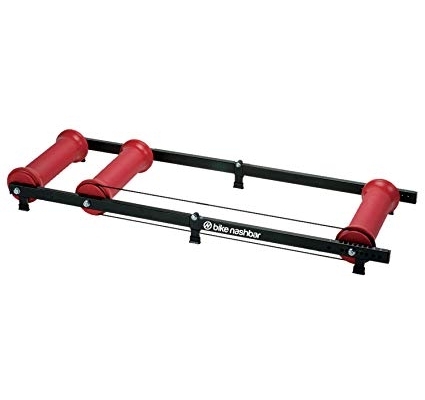 – easier to patch on the road, no need for gluing, stretching tire, etc. The ride quality and weight differences between tubulars and clinchers are getting smaller, but will always continue to be there. Especially with carbon wheels – carbon clinchers are more difficult to make and will be heavier than their carbon tubular rim counterparts.